While a less-informed observer might be tempted to think that the youth orchestra movement in Los Angeles began following the arrival of Los Angeles Philharmonic Music Director Gustavo Dudamel, nothing could be further from the truth. Perhaps the first and foremost exhibit against this fallacy would be the American Youth Symphony, which will be celebrating its 50th Anniversary season this fall. AYS, which culls its members from a variety of schools and conservatories around town, continues to be one of the absolute best values in classical music anywhere. The concerts, though ticketed, are free for attendees providing a top notch concert experience to an audience that might not be able to afford to attend an orchestra performance of this caliber otherwise. AYS’ Music Director and Conductor, Alexander Treger, has been helming the orchestra since 1998, and his tradition of exciting, exuberant performances will continue into this coming anniversary season. Two weeks ago AYS concluded its most recent season with an excellent performance designed to highlight it ensemble’s history and mission. The show was part of the orchestra’s Alumni Project where one of the group’s illustrious former members returns to celebrate AYS's legacy to the musical world. That is no small matter. AYS alumni populate major American orchestras of all stripes and make up significant percentages of most of the major performing ensemble here in Los Angeles. 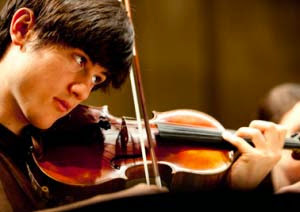 This evening’s featured alumnus was violinist Nigel Armstrong who won 4th prize at the 2011 Tchaikovsky Competition. Armstrong was featured in the first half of the evening, which focused heavily on French works including Chausson’s Poeme and Saint-Saens’ Introduction and Rondo Capriccioso. There’s nothing quite as enjoyable as seeing a soloist who is as well loved by the hosting ensemble as he is so technically skilled, and Armstrong quickly won over the audience with an articulate spirited performance. The rest of the night was devoted to Strauss’ An Alpine Symphony. Treger elicited a solid well-structured performance of this Romantic landmark work. It played to the orchestra’s strengths and most of all allowed the spirited excitement of the players to shine through. There will be more of these wonderful performances starting this fall when the ensemble returns for its anniversary season.